In Diadema, many women feel like princesses and Queens. It is easy to make it yourself. The process is very exciting, develops creativity masters. For a start, take the wire and cut with wire cutters 25 centimeters. First make the individual parts of the tiara, and then connect them in a certain way. Fold this piece in half through its two ends, slide a bead up to the top. Roll five times the wire under the bead. Instead of beads you can use the pearls. Disconnect the two wire end and head beads. Now you need to put each of these ends of five pieces. You need each bead to push up to busine or pearl. The result is a figure that consists of beads on top and two pieces of wire, each of which is suited at the five things beads. Now you need to make a loop. To do this, again loop the wire a few times. Get a loop of beautiful jewelry. Again connect the two ends of the wire, attach a bead on them. Then again pinch both ends of the wire in different directions, and put on each side have up to eight beads. Make a wire loop. One part of the tiara ready. This was her first item. Continue to create the diadem with his own hands. Cut six pieces of wire at 20 inches. The first bead put on, as in the previous case, loop the wire, put both ends together and thread them on 10 beads. It turned out the six parts of the second kind. To make a beautiful tiara still needs quite some work to do. 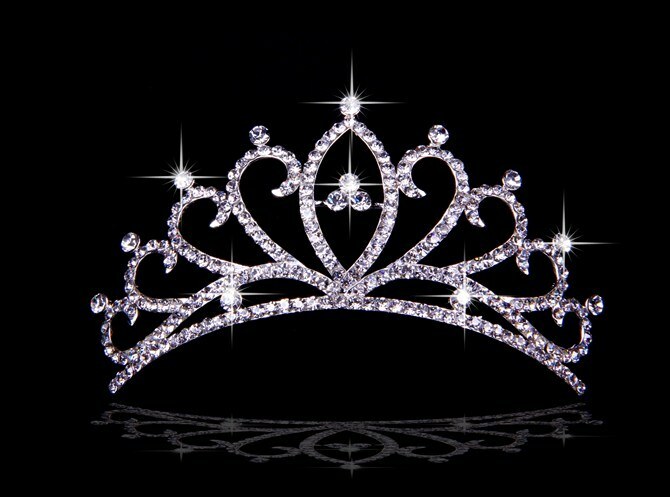 Tiara recently became stylish and fashionable decoration. Left to do the third type of details. Again cut the wire, but at 15 centimeters or six pieces. The first bead string on both ends of the wire, then loop it again and for each of the two legs of the wire put three beads. To do before the end of a charming head ornament, just got to connect and link together all the details. Take the wrap and exactly in the middle, fasten on the first part. Now, symmetrically to the right and to the left of the parts attach, alternating, six constituents of the crowns of the second and third types. Take a piece of wire a little more (about 60 cm) and Obratite them all the tiara from one to the other. You can take the pearl, threading them through the wire that they were on the front of the ornaments. If you apply in the work of pearl, sequins, rhinestones, you can create a wedding decoration. His girl can wear and when to get engaged with your beloved.